Friday June 24th 1881 I went over home with Hatt to help her with some work she had to do. Mother came over in the buggy and I rode home. I practiced a little in the afternoon and evening. I feel horrid tired all the time. Saturday June 25th 1881. I did up my share of the work this morning and worked on some edging for my skirt. There was a very hard rain early this morning. I went to town about the middle of the afternoon thinking I would go to Auntys but John said Hatt did not feel very well so I went down there and stayed till nearly night. I practiced a little in the evening. 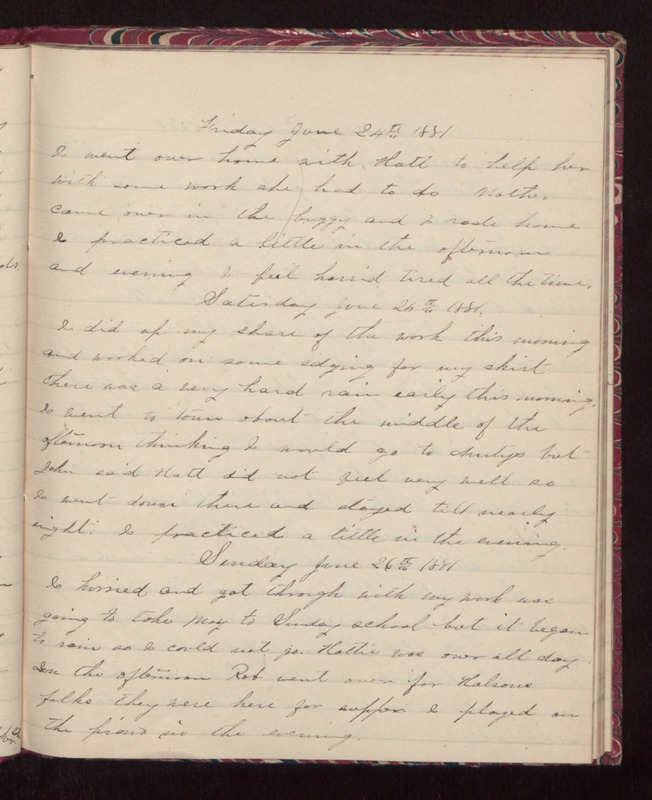 Sunday June 26th 1881 I hurried and got through with my work was going to take May to Sunday school but it began to rain so I could not go. Hattie was over all day. In the afternoon Rob went over for Halsons folks. They were here for supper. I played on the piano in the evening.